Learn more about Kristy’s 2016 automotive marketing secrets with Advanced Training from Automotive News. When Auburn Volkswagen was looking to lower email opt-out rates and send personalized communications based on customer behavior, they didn’t increase their marketing spend, they reduced it by removing two other point solutions and switching to a customer engagement platform that worked for them—Outsell Fuel. 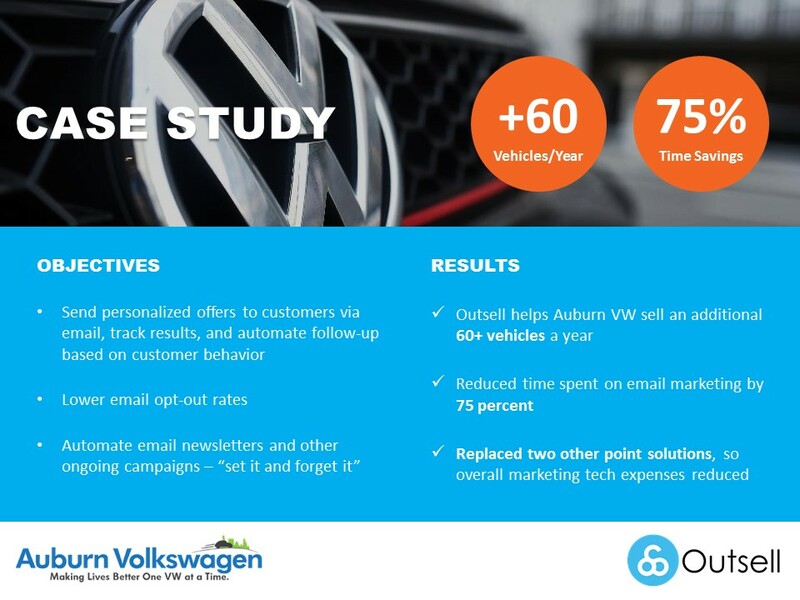 Outsell helped Auburn VW sell an additional 60+ vehicles a year, and reduced their time spent on email marketing by 75 percent. With auto sales declining, now is the time to utilize personalized offers with automated tracking and follow-up to help strengthen customer relationships and identify in-market buyers. Learn more about our behaviorally-targeted email campaigns.